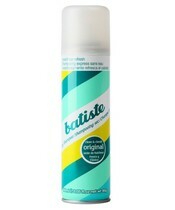 Bastiste Dry Shampoo Original is a dry shampoo that refreshes hair between washing. Tørshampooen has a refreshing scent that breathes new life into greasy, dull and lifeless hair. The hair is left straight away with a sense of purity, with plenty of body and smells heavenly. Quick and easy to use, no matter where you are. Please shake vigorously before use and between applications of the content. The spray is applied in a range of 30 cm. away from the hair. Apply lightly and evenly throughout the hair. Use your fingertips to distribute the product around the hair. Let it work for a short øjelblik. The product is then brushed out of the hair with a comb or brush. Perfect for use with extensions, so you can go a few days longer between hårvaskene, thereby reducing wear on your extensions!